Then Pilate tried to release [Jesus], but the Jewish leaders shouted, "If you release this man, you are no 'friend of Caesar.' Anyone who declares himself a king is a rebel against Caesar." When they said this, Pilate brought Jesus out to them again. Then Pilate sat down on the judgment seat on the platform that is called the Stone Pavement (in Hebrew, Gabbatha). It was now about noon on the day of preparation for the Passover. And Pilate said to the people, "Look, here is your king!" "Away with him," they yelled. "Away with him! Crucify him!" "What? Crucify your king?" Pilate asked. "We have no king but Caesar," the leading priests shouted back. God was Israel's true king while the human king who sat on Israel's throne in earlier times was considered God's son, or prince. 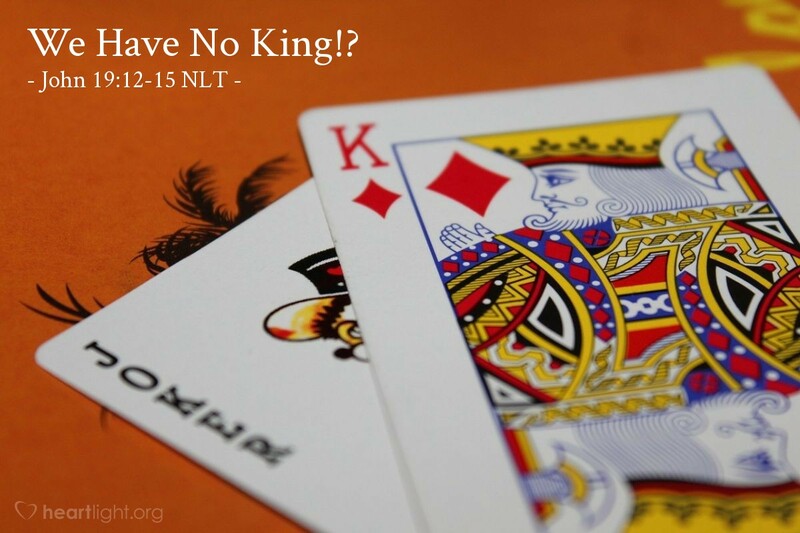 So often, Israel chose to go with their human king and abandon their heavenly king. Once again, the leaders of God's people pulled them away from their heavenly king and pledged their loyalty to a secular king. Their actions are a warning of how easily we can be dissuaded from giving our complete loyalty to the only true Lord and King, Jesus. Almighty God, my precious and righteous Father, please keep my heart pure in its allegiance to you. I don't ever want to let anything or anyone lead me away from my loyalty to you. Forgive me for the past times when I've let other things distract my attention and distort my loyalty. Thank you, in Jesus' name. Amen.